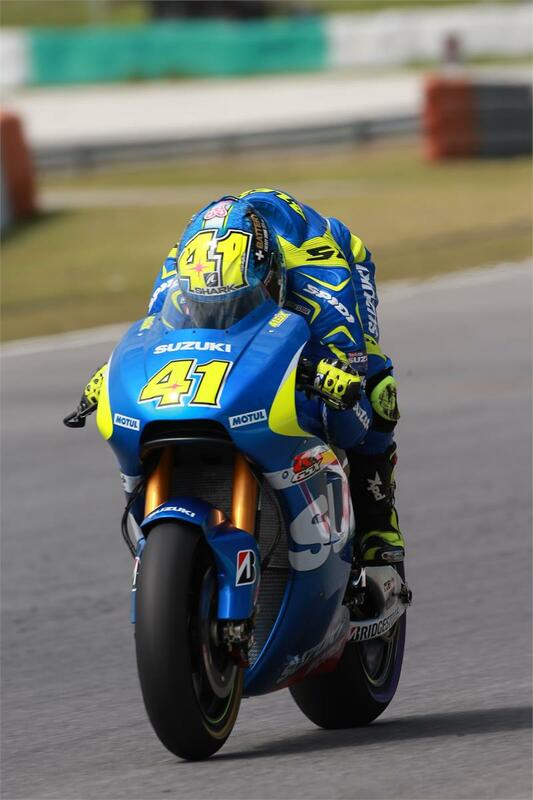 SUZUKI MotoGP continued to make strong and positive progress in the second day of testing at Sepang International Circuit in Malaysia today as Aleix Espargaro and Maverick Vinales significantly improved their lap times. Espargaro moved up into 10th position on the first two days of combined times with a lap of 2:01.344; which was just over 800ths-of-a-second quicker than Wednesday’s time of 2:02.225. Vinales made even greater improvements aboard his factory GSX-RR, lapping 1.24 seconds-faster and posting a time of 2:01.916 around the 5.543km circuit; placing him 15th overall in the rankings. Today’s test was held in sunny conditions with air temperatures of 31.9C and track temperatures reaching 52.5C. Tomorrow, SUZUKI MotoGP will continue to evaluate the new settings on the GSX-RRs and plan a full-race simulation testing. SUZUKI MotoGP concludes its first test of 2015 tomorrow and will return to the Sepang International Circuit at the end of the month for a further four-days of testing in preparation for the opening round of the MotoGP World Championship at Losail, Qatar on March 29th. Sepang Day 1 & 2 Combined Times: 1 Jorge Lorenzo (Yamaha) 1:59.963, 2 Andrea Dovizioso (Ducati) 2:00.015, 3 Marc Marquez (Honda) 2:00.146, 4 Dani Pedrosa (Honda) 2:00.260, 5 Valentino Rossi (Yamaha) 2:00.380, 6 Andrea Iannone (Ducati) 2:00.391. 10 Aleix Espargaro (SUZUKI MotoGP) 2:01.344. 15 Maverick Vinales (SUZUKI MotoGP) 2:01.916.